HDMI ARC and HDMI eARC: everything you need to know | What Hi-Fi? What exactly does HDMI ARC do? Is it actually worth using? The trusty High-Definition Multimedia Interface has been the go-to digital connector for flatscreen TVs, projectors and other AV equipment for getting on for 15 years now. HDMI ARC (Audio Return Channel) is a clever protocol that sits within the HDMI standard and, in theory, it can help simplify a complicated AV set-up and reduce the number of cables you need. What is HDMI and HDMI ARC? HDMI launched way back in 2002, and the first consumer kit to feature this high-tech connector hit the shops in 2004. It was billed as a convenient way to send high-quality digital picture and sound data ‘upstream’ from a source to a TV, amplifier or soundbar. 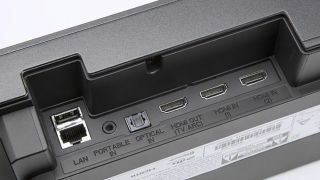 As HDMI has become the de facto AV connection, traditional analogue sockets such as SCART and component video have found themselves consigned to the spare parts bin. The HDMI interface has evolved over the years, with new versions (the spec of HDMI 2.1 has just been finalised) bringing support for new audio and video technologies such as 3D, 4K, 8K, HDR and high frame rates, to name but a few. It wasn’t until 2009 that the HDMI ARC protocol was added to the spec-sheet. It was introduced as part of HDMI version 1.4 and has been part of the specification ever since. When would you use HDMI ARC? Picture the scene. You have a set-top box, games console and Blu-ray player all plugged into your TV via HDMI. Or perhaps your smart TV is using a built-in video app such as Netflix or Amazon Prime Video. Either way, you don’t want to use your TV’s speakers for audio - you’d rather hear everything played through a soundbar or home cinema amplifier instead. Previously, you would have to connect an optical cable from the back of your TV to an optical input on your audio device. But that’s a messy solution. Theoretically, HDMI ARC solves this problem. HDMI ARC removes the need for an optical cable and allows you to send audio ‘downstream’ from a compatible HDMI socket on your TV to a compatible HDMI ARC socket on a soundbar or AV receiver. What do you need to use HDMI ARC? To take advantage of HDMI ARC, you’ll need a television and audio processor (AV receiver or soundbar), with matching ARC-enabled HDMI sockets. Peer around the back of your TV - if it’s packing three or four HDMI sockets, you need to find the one that’s labelled “(ARC)”. Labelling isn’t compulsory, but as long as your TV is a late-2009 model or newer, there should be one at your disposal. Consult the TV’s user manual if you’re unsure. With some TVs, HDMI ARC might work automatically. If it doesn’t, you’ll need to grab a remote and tweak a few of your TV settings, including turning off your TV’s built-in speakers and enabling your telly to send audio out to an external speaker or amp. Using HDMI ARC doesn’t require a new HDMI cable. Any HDMI cable should be able to cope with the requirements - it’s only when we move on to eARC this could (potentially) become an issue. But more on that later. As part of the process, you should consider enabling HDMI CEC (Consumer Electronics Control) so you can turn your TV on and control volume without the need for multiple remotes. A word of warning, though: turning HDMI CEC on can have some unwanted AV side-effects - so you might want to experiment first. Are there any issues with HDMI ARC? Worried about potential lip-sync problems? HDMI v1.3, launched in 2006, added automatic audio syncing, although it was only optional. This means some ARC-enabled products will play together nicely, others might not. The biggest problem for ARC in its current guise is manufacturers have been left to pick and choose which elements of the protocol they want to include. Support for all relevant audio codecs isn’t compulsory, so you can’t simply assume that a TV will be able to send a 5.1 Dolby Digital or DTS soundtrack from a movie over ARC. Some TV manufacturers only support Dolby Digital while others only support two channel stereo, which completely defeats the point. It’s worth noting ARC doesn’t allow you to bitstream the full-fat high-quality codecs such as Dolby TrueHD or DTS-HD Master Audio soundtracks that you find on Blu-rays and 4K Blu-rays. It simply strips out the core 5.1 data stream. If you want this level of functionality, you’ll need HDMI eARC. What is HDMI eARC? What are the benefits? Enhanced Audio Return Channel (also known as eARC) is the next generation of ARC. It’s a feature being implemented in the upcoming HDMI 2.1 specification. The main benefit of eARC is a big boost in bandwidth and speed. This allows you to send higher-quality audio from your TV to a soundbar or AV receiver. There’s scope for eARC to deliver up to 32 channels of audio, including eight-channel, 24bit/192kHz uncompressed data streams at speeds of up to 38Mbps. This means all those high bitrate formats currently available on Blu-ray discs, 4K Blu-rays and some streaming services – Dolby TrueHD, DTS-HD Master Audio and object-based formats such as Dolby Atmos and DTS:X – will all be compatible. But whether manufacturers choose to support them all remains to be seen. On paper, HDMI eARC should also make the handshake between compatible devices much smoother and negate the need to activate HDMI CEC (which doesn’t always work properly) - so operating multiple products shouldn’t require any extra steps to get things up and running. As is the case with ARC, you’ll need two devices with compatible HDMI eARC sockets for the protocol to work. This means they need to meet the HDMI 2.1 standard but, at the time of writing, there are no products carrying HDMI 2.1 currently on the market. So when will 4K TVs from LG, Panasonic, Samsung or Sony arrive with HDMI 2.1 compatibility? Our guess would be early 2019. Products with eARC, however, are coming out slowly. Onkyo and Pioneer are the first to offer eARC updates on select AV products, mainly: Onkyo TX-RZ830, Integra DRX-5.2, Pioneer SC-LX502 and Pioneer VSX-LX503 AV receivers. Sony followed quickly after with updates to its soundbars (HT-ST5000, HT-ZF9, HT-XF9000) and AV receivers (STR-DH790, STR-DN1080) making them compatible with eARC-supported Sony AF9 and ZF9 TV models. All firmware updates are available now. Do I need new HDMI cables to use eARC? According to HDMI.org, if you currently use a standard HDMI cable with Ethernet, or a High Speed HDMI cable with Ethernet, you should be fine. Ultra High Speed HDMI cables with Ethernet will definitely work. Because of the extra bandwidth needed for some audio formats over eARC, it’s possible that very old cables could struggle. It’s something we’ll be sure to investigate when compatible products start to hit the market. Is eARC backwards compatible with ARC? If your TV is HDMI eARC enabled, but your AV amp or soundbar is only compatible with HDMI ARC, it’s likely you’ll get a sound - but the bandwidth restrictions of ARC will mean you won’t be able to experience the high bitrate audio that eARC can provide. So no, it's not backwards-compatible. Some AV receivers and soundbars that don’t have HDMI 2.1 chipsets can be upgraded to support eARC, but it varies between manufacturers and models. It depends if they are using compatible hardware that can accept the necessary firmware update. Time will tell how well integrated eARC will be, but we're hoping adoption becomes as ubiquitous as HDMI ARC seems to be now.